Unlit Lamps Remind us they are never Extinguished, a photo by timtak on Flickr. 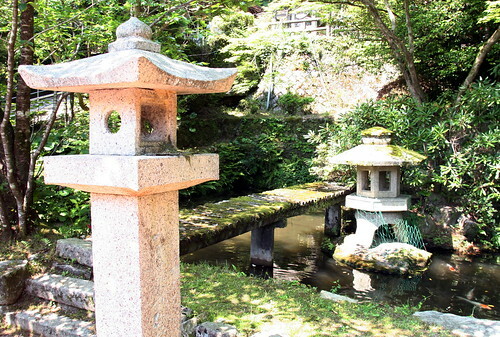 In front of many Shinto shrines there are many stone lanterns. They have the shape of lanterns. They have windows in them representing the sun and the moon. But perhaps it is more appropriate to say that they are copies of lanterns because, in the vast majority of cases the simulated lanterns are never lit. They may appear to be fake lanterns, containing nether candle, nor any sort of lamp. So what are they doing there? It seems to me that these lamps draw attention the visual or qualia field of consciousness, or in other terms, "the mirror of the sun goddess". It was this mirror that became the first copy-that-was-not-a-copy, in Shinto mythology. Amaterasu, the Sun-Godess appeared to have been fooled by it, tricked out of her cave, but was she? Was she perhaps not a mirror all along? Certainly when the first imperial ancestor left her company for Japan he was given, as a senbestu of sorts or keepsake, a mirror, which the first emperor was told to worship as if it were the original. This mirror or field always extended, and in a sense alight, while we are awake, and can not be turned off other than globally by death, unconsciousness and sleep. The lanterns in front of Shinto shrines are thus never extinguished and in a way shiny brightly, even or especially in daylight. So bearing that in mind, are these lanterns copies of lanterns, or really lanterns after all? Some people believe that words mean ideas and that these ideas are somehow both in the mind and in the world (or the mind of god). They believe furthermore that the meanings of words are not copies, but always authentic in each and every instantiation. The Japanese may believe that the world they see is both in the mind and in the world (or the mind of a different type of God). In that case perhaps "copies", such as copied horses or copied shrines, are not copies at all but the real thing.